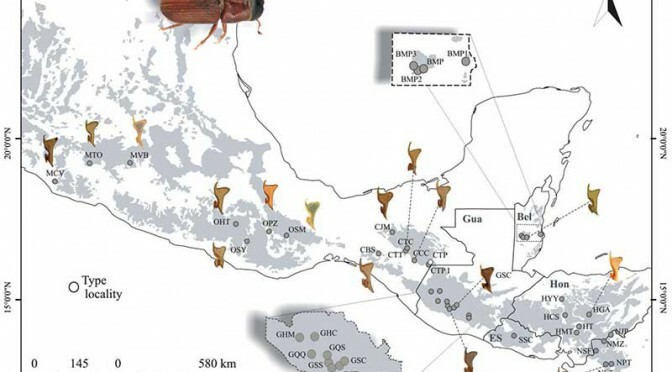 An international team of scientists have identified a new species now called “the mesoamerican pine beetle” that is causing “catastrophic” damage to forests across Central America. The new species, Dendroctonus mesoamericanus, works in concert with its cousin, the southern pine beetle, Dendroctonus Frontalis. Both are responsible for damage to pines, according to the United States Department of Agriculture. 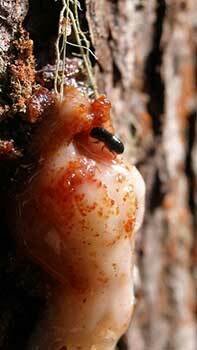 Bark beetles of the genus Dendroctonus rank high among the most destructive conifer pests. The mountain pine beetle has destroyed forests across British Columbia and is now moving into Alberta. The USDA says attacks “attributed to the southern pine beetle has led to declines in pine forests and multimillion dollar losses in timber, recreation, and other ecosystem services,” in Mexico, Belize and other countries in Central America. As far back as 2002, scientists suspected, but could not confirm, that the problems in Central America were caused by two different pine beetles. From early 2000 to 2002, 25,000 hectares of mature pine stands in the Mountain Pine Ridge Forest Reserve of Belize were devastated by an outbreak of what was initially identified as the southern pine beetle. At the time the scientists investigating the outbreak suspected the trees were also infested by a second insect that they then called the “caribbean pine beetle.” However, there was insufficient evidence at the time to warrant scientific publication. Between 2006 and 2010, Brian Sullivan, an entomologist with the USDA, and his colleagues, conducted studies on the pheromone and body wax chemistry of the beetle. Those studies provided clear biological evidence that it was a species new to science. Extension and forest health education programs in the Central American region have already begun to include information on the mesoamerican pine beetle. An adult mesoamerican pine beetle is shown removing resin and boring dust from the entrance of its gallery. Field observations suggest that the new species attacks trees shortly after southern pine beetle, colonizing the lower trunk and branches. The mesoamerican pine beetle also has a distinct pheromone chemistry and does not respond to traps baited with southern pine beetle lures. 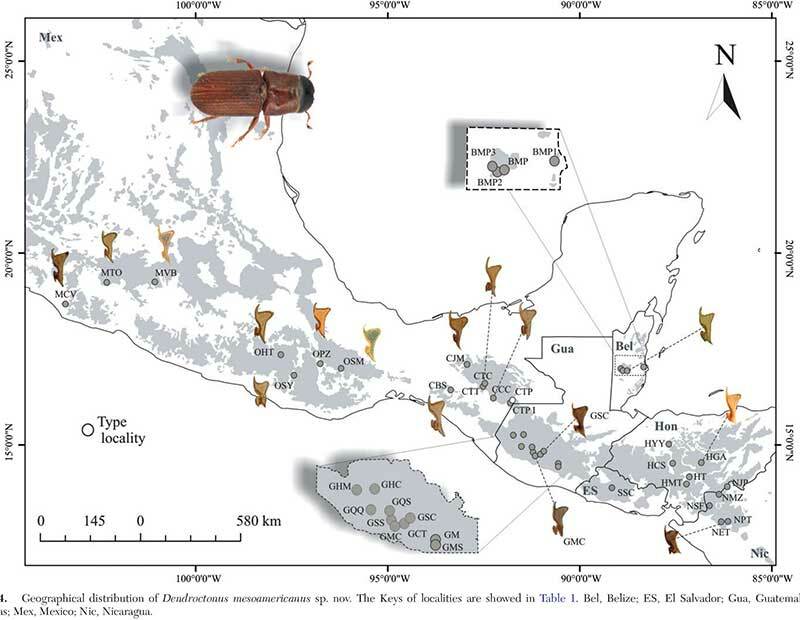 Researchers have found mesoamerican pine beetles attacking eight species of native Central American pines and have collected the insect from Belize, southern Mexico, in Oaxaca, and Chiapas states, in Guatemala, El Salvador, Honduras, and Nicaragua. In these countries, the species has been collected at elevations from 311 to 2600 metres. 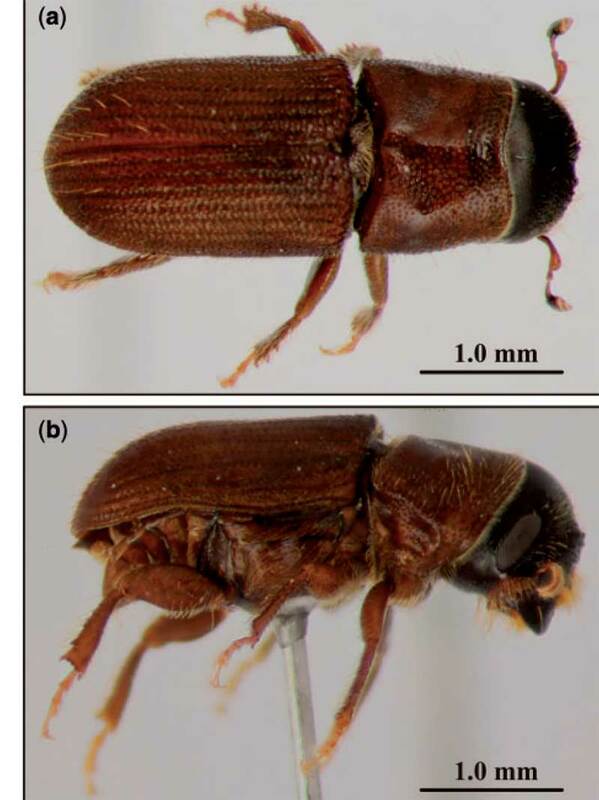 Initial observations may indicate that the mesoamerican pine beetle is not as aggressive as the southern pine beetle, but may take advantage of trees infested by the southern pine beetle, making things worse. Authors of the description paper in Annals of the Entomological Society of America include Dr. Brian Sullivan, research entomologist with the Forest Service Southern Research Station, Francisco Armendariz-Toledano, graduate student with the Instituto Politecnico Nacional (IPN) in Mexico City; Dr. Gerardo Zuniga of IPN, Dr. Lawrence Kirkendall of the University of Bergen, Norway, and Alicia Nino, graduate student at El Colegio de la Frontera Sur (ECOSUR), Chiapas, Mexico. Robin, sad to hear this beast and cousins are proliferating. According to the University of Alberta, it first identified the mountain pine beetle as having infested Albertan Jack Pine forests by 2011. Socially and economically destructive.